Happy Monday! I hope you all enjoyed your weekend! It’s been a little on the crazy side over here, I’m not gonna lie. Work and family are keeping me busy, so I apologize for my lack of posts these days. I truly do miss you all, and although I don’t have any major projects to share, I did want to pop in with a quick update on my entryway space. I’ve been in the mood for spring (I know, I know, it’s still to early!) and have been adding little bits of “spring” throughout my home. My entryway was the first space I went to work on, since it’s been the most neglected lately. I didn’t make any major changes, just lightening up the space with natural elements. Of course, I added some vintage pieces from the shop, because it’s such an easy way to add instant character. Some wicker baskets and a pretty enamel pitcher lighten up the shelf area. Sometimes the simplest touches make the biggest difference! that is soooo gorgeous Amy!! 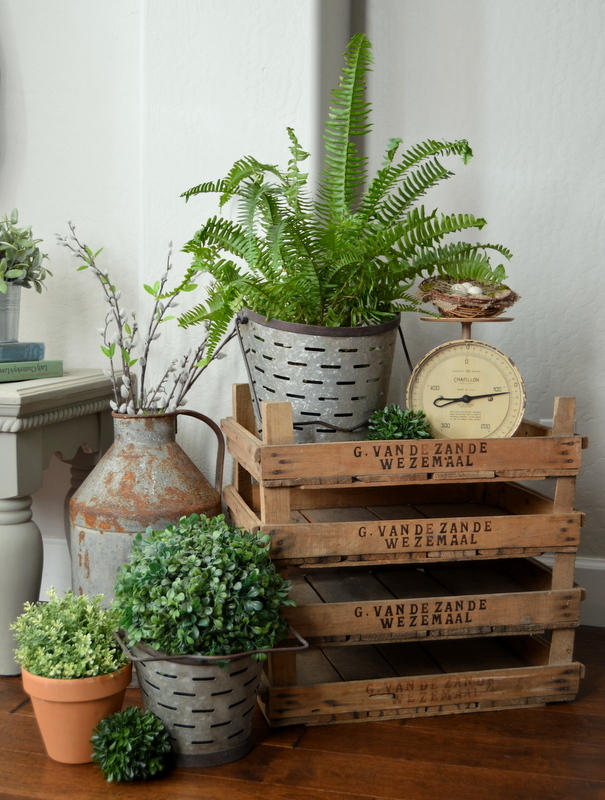 I love all the plants and crates to the side!!! So pretty Amy! I enjoy seeing how you put everything together, you have such a knack for it! 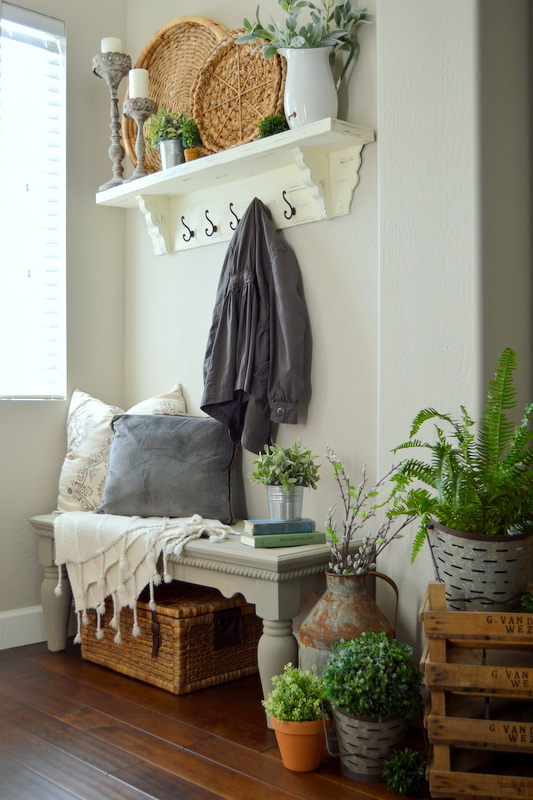 Love the wicker basket touches and all the greenery. Makes me long for spring- despite just receiving some snow today. Hope all is going well for you! So ready for Spring! 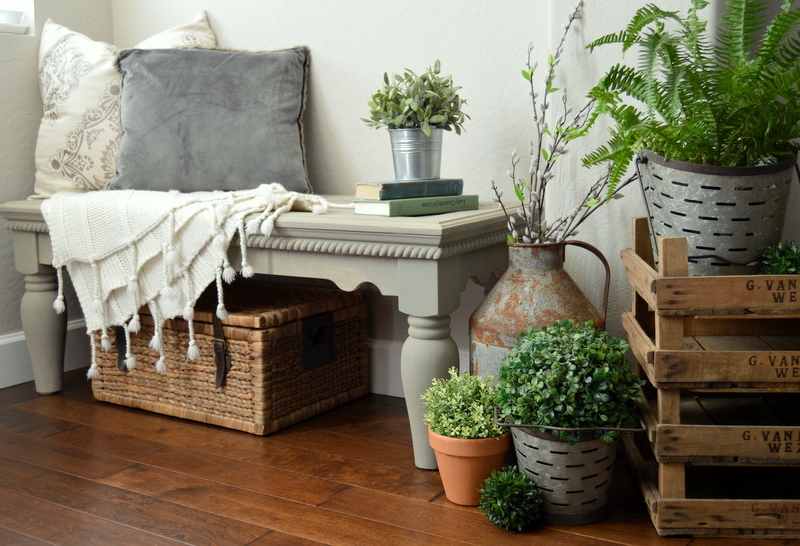 Your entryway is fresh and cheerful … just lovely! 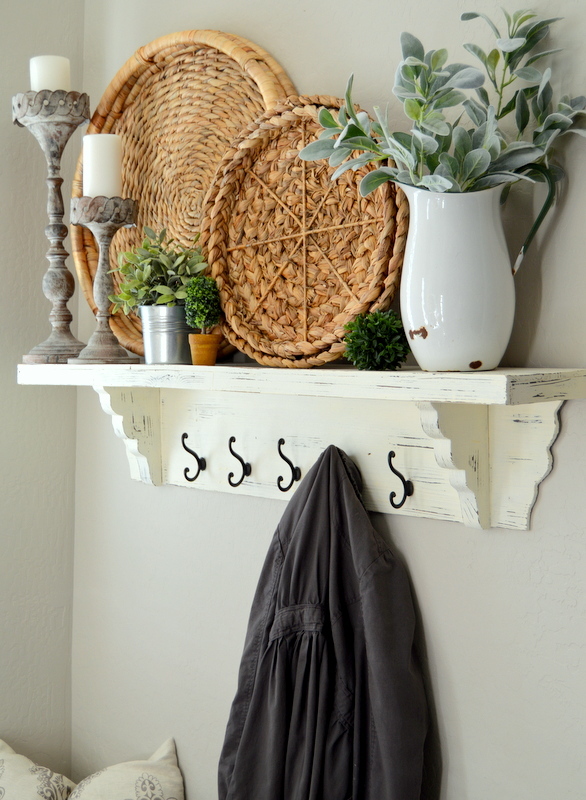 I have certain bloggers I always go to for certain inspiration & you are always for the entryway!!!! Seriously, you have the BESTTTTT entryway decor & design ever!. It’s always so fresh, eye catching, practical & fun!! 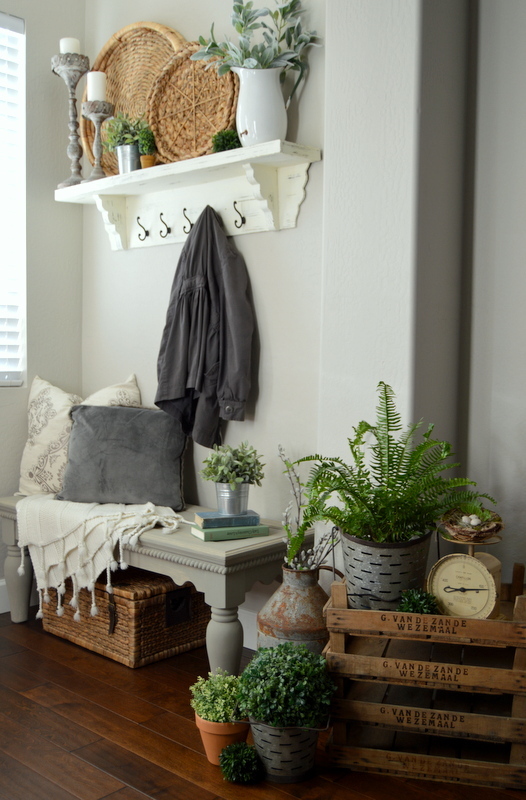 I’m in love with that grey bench & all the neutral touches!! #myfavorite! Happy Tuesday,Amy!! I love the shelf you have! Did you purchase it somewhere or make it? I am trying to make a decision on what to do in my small apartment and I really love the shape of this shelf. Hi, and thank you so much for your sweet comments! I found the shelf at HomeGoods, in the “damaged” section. It was missing one of the hooks, so I replaced them all with hooks I had on hand and gave the whole shelf a coat of white paint. I have seen similar ones at Kohls and Target, pretty recently. I hope that helps – good luck with decorating your apartment, I’m sure you’ll find the perfect pieces! Where is the wall shelf from? Hi Kinsey! The wall shelf is from HomeGoods.